The 161st Battalion of Huron County began their journey to the battlefields of France on Thanksgiving weekend of 1916. Two special events will mark the 100th Anniversary on Saturday, Oct. 8. 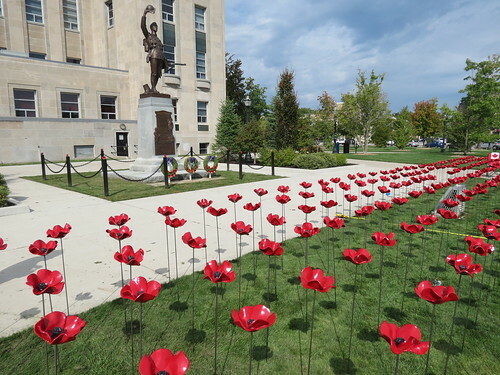 The first event is a Victory Parade that will be a partial re-enactment of the final march around Goderich Square and down East Street to the former train station that the 161st made one hundred years ago. The Victory Parade begins at 2 p.m. and features historic re-enactors, mass pipe and drum band, cadet corps and color guards. The parade will enter The Square at Kingston Street and precede down East Street to the former train station. Historic re-enactors from The Great War Society will run drills prior to the parade at the Huron County Museum, 110 North Street, Goderich starting at 11 a.m. The public is invited to visit the military gallery at the museum and the new Light Armored Vehicle (LAV) monument. Following the parade, The Royal Canadian Legion, Goderich Branch 109 will host a 161st Battalion Descendants Dinner. The Legion will be serving a meal that follows the menu from the original dinner that was served to members of the Battalion on Thanksgiving weekend in 1916. There will be displays about the First World War and the 161st Battalion. A cocktail hour and social time will begin at 5:30 p.m. with dinner set for 6:30 p.m. followed by guest speaker, David Yates and period musical entertainment by Seaforth Harmony Kings and “thatotherchoir”. Tickets are $35 each and can be purchased through the Blyth Festival Box Office at 519 523-9300. Everyone is welcome to attend the dinner. The parade and dinner are part of a series of events taking place this fall to commemorate the 100th Anniversary of the deployment of the 161st Battalion and Huron County’s role in the First World War. The Government of Canada, County of Huron, Town of Goderich and Huron Arts and Heritage Network provided support to a committee made up of local heritage organizations to develop these events. For more information on the events and the 161st Battalion visit www.huroncountymuseum.ca. As the county celebrates the 100th anniversary of the creation and deployment of the 161st Huron Battalion comprised of men from the county who saw action in World War I people may begin to wonder about the soldiers themselves. There is a place to go on the internet where their curiosity can be sated, where they can learn more about these young men who paraded around The Square headed down East Street and marched off into history one hundred years ago this Thanksgiving weekend. The http://huron161st.com website project began when Jodi Jerome, historian, and Tim Wellstead, owner of Condor Fine Books in Kincardine) and the Book Barn in Wingham, discovered an unpublished manuscript about the 161st Huron Battalion but couldn’t find the manuscript’s author, Sandy MacDonald, despite some promising leads. MacDonald’s work was created from his research and interviews with 161st veterans and their families in the late 1970s and early 1980s. He copied his manuscript and gave it to certain veterans and subscribers to his 161st newsletter. According to the two historians, both MacDonald and copies of his newsletter have been impossible to track down. Unwilling to leave MacDonald’s work moldering in the dark, Jerome and Wellstead took up his effort to write the story of the 161st Huron Battalion. This battalion was comprised of Huron County men recruited in 1916 and transported to England together. They started over three years ago in their spare time and began verifying MacDonald’s research, accessing military records not easily accessible to him in the 1980s and adding to the history. Their goal was to create a day-by-day diary of the 161st Huron Battalion and meet the men who made it a unit. They choose to begin with a website that, unlike a book, could be added to and expanded as new information came to light, a living history. They launched their website on Dec. 2, 2015 - 100 years to the day that the Battalion was born. They will continue the 100-year journey until the Battalion closes (early in 2018). As more information is uncovered, it will be shared on the website. People are invited to read the Battalion’s stories, find family roots among the ranks and see the faces of the young and older men who gave their time to their country. 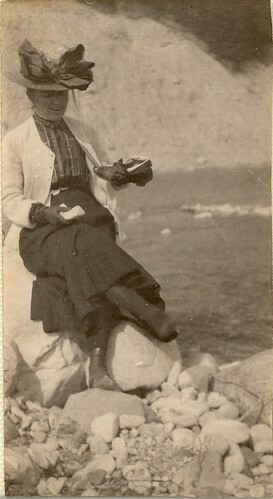 Jerome and Wellstead can be contacted through the comment section of the website (http://huron161st.com) by those with insight, stories, letters and photos to share. According to the website’s creators, though many young men left with the Battalion expecting travel and a grand adventure, they met war and death face-to-face. Some never talked about it again after returning home, if they returned home. This project gives their experience and them a voice and lets them talk about all they saw and felt as a group, as the Men of the 161st Huron Battalion. Bayfield Ratepayers’ Association (BRA) was asked to help focus on the future of the village and with the help of other community organizations develop a 10 year-plan that will protect its special public appeal during a period of municipal challenges. Bayfield Councilor Bill Whetstone shared several serious challenges facing Bluewater Council that will impact on Bayfield. He told residents attending the meeting of Councilor’s Corner in the community hall on Sept. 29 that the tax dollars for Bluewater will be in short supply in the future. The impact could push too much, too fast on Bayfield. It will take time, patience and hard work to study individual challenges facing the village, he added. An expanded sewage system will be expensive. Building a new bridge on Hwy. 21 will impact on the community for the next four years. While the bridge construction is taking place there could be pressure to refurbish Bayfield’s Main Street with a wider road, new drainage, new walks and new lights. 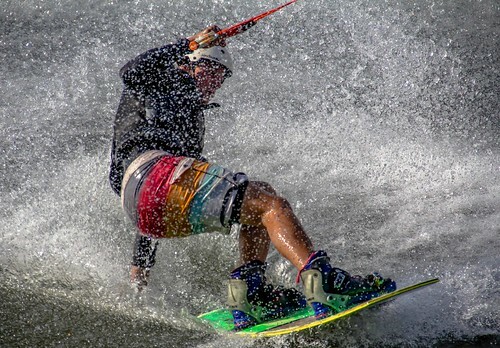 Meanwhile, another group of villagers are starting to look at recreation needs for communities. For the past two years Bluewater has been told three arenas are too expensive for the municipality. Because Bayfield has the oldest arena, the two villages of Hensall and Zurich feel they should be allowed to keep their arenas. Former Bayfield Councilor Geordie Palmer told the audience Bayfield is facing a number of big challenges. It’s time for the BRA to again expand its membership to help with community leadership. Palmer is a member of the BRA executive that will hold its annual meeting Oct. 8 at 10 a.m. in the Bayfield Lions’ Community Building. All interested in the need to protect and foster village interests are invited to attend. Histories that never made it to the page are taking the stage on Oct. 15 at the Livery Theatre, Goderich as part of Unharvested Histories, a night of live performance and film showcasing diverse, unheard perspectives on the past. Over the course of one unforgettable evening, University of Michigan Professor Henry Greenspan will perform theatre based on his decades of interviews with holocaust survivors, historical interpreter Colleen Maguire will give an interactive performance as nineteenth-century Huron Jail matron Margaret Dickson, Metis scholar Jesse Thistle will present a film created with collaborator Martha Stiegman examining the personal impact of the erasure of Indigenous stories, and ‘The Ladies of the CNR’ led by Kelly McIntosh, Baptiste Neis and Stacy Smith will bring the working women of World War Two era Stratford to life. The co-founders of ‘Staging Our Histories’, the non-profit group producing the event, met as graduate students at Carleton University and hosted an inaugural night of performances in May 2015 at Ottawa’s National Arts Centre. Since then Staging Our Histories has continued to share history off the page across Canada and throughout the world, with a recent event in Bangalore, India. Unharvested Histories is a partnership with the Huron Arts and Heritage Network and is partially supported by the Huron Heritage Fund. Performers were selected from an open call for unheard histories earlier this year, and will participate in interactive talkbacks with the audience. Co-director Sinead Cox is looking forward to hosting Unharvested Histories in her hometown of Goderich. Unharvested Histories tickets are on sale now at the Huron County Museum (110 North St., Goderich) or online at www.staginghistories.eventbrite.ca. Doors open at 7p.m. 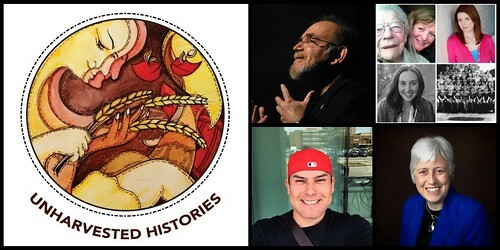 on Oct. 15th at the Livery Theatre and Unharvested Histories take the stage at 7:30 p.m. Find out more about Staging Our Histories on their website (stagingourhistories.wordpress.com), or follow them on Facebook (www.facebook.com/StagingOurHistoriesOttawa/) and Twitter (@stagehist). Only about two per cent of Ausable and Bayfield river watersheds are wetlands. Staff members with the Healthy Headwaters Wetlands Initiative work with participating landowners to restore these habitats. 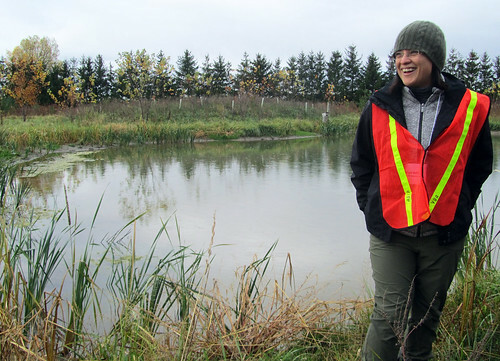 The Healthy Headwaters program offers technical advice and financial incentives for people who want to create, enhance, or restore wetlands on their property in Huron, Middlesex, and Lambton counties. Healthy Headwaters is entering its tenth year in 2017. Since 2008, local landowners have completed more than 60 wetland projects through the program. In addition to the wetlands, local landowners have also planted more than 255,000 trees, shrubs and plants into wet areas and watercourse buffers. Wetlands are areas of land that are wet for all or a portion of the year. Wetlands tend to have soils that drain poorly. They also have water-loving plants such as Sedges, Rushes, Blue Flag Iris, White Turtlehead, and Red Cardinal flowers. Wetlands provide water quality and water quantity benefits. 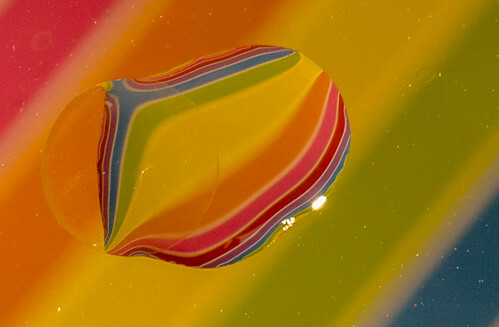 They help to absorb, store and filter water when there is too much water during a storm or flood event. They also help to release needed water when there are times of low water or drought. Wetlands also provide habitat for birds, frogs, deer, and waterfowl. Healthy Headwaters also offers chances for local community members to learn about the benefits of wetlands and their role in nature’s ecosystem. Staff members thank all the landowners and funding partners who have supported Healthy Headwaters over the past nine years and invite other landowners to join this important work. To find out more about possible wetland projects on your property visit abca.on.ca or phone 519-235-2610 or toll-free 1-888-286-2610. As darkness falls on Saturday night, Oct. 8, a hidden, darker side of Bayfield’s past will emerge. Over the decades, there have been many unexplained events, cruel murders and strange happenings in the village. 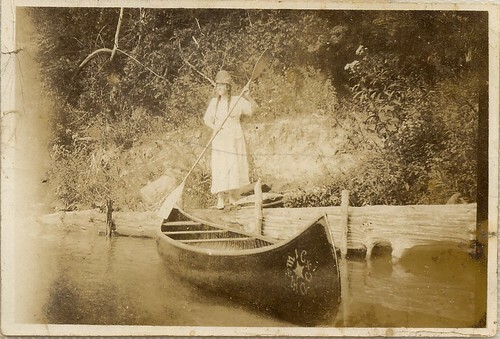 Dave Gillians, the author of ‘For the Love of Bayfield’, on behalf of the Bayfield River Flats fundraising campaign, will vividly describe documented cases of sightings and unexplained occurrences of real people who lived in Bayfield. Some of the tales will chill the blood and the stories will resonate in your mind, long after the lantern dims at the end of the night. The walk will begin at 7 p.m. near the gates of Clan Gregor Square and should last about one-and-a-half hours. Donations in support of the Bayfield River Flats Natural Area will be appreciated. For those of you who have already contributed, please wear your badges, t-shirts or carry your tote bag to show everyone you are a proud supporter! 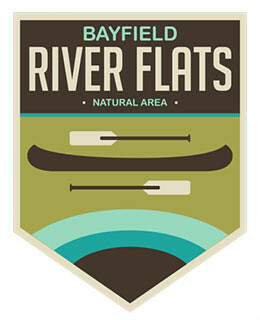 Bayfield River Flats t-shirts or tote bags are offered to donors who contribute $250 or more at Main Street Optometric in the village. Campaign sponsors who donate $1,000 or more, will be publicly recognized with a permanent plaque installed on the ‘Flats’ property. Donors from all over the world, can contribute to this campaign through a “crowd funding” program on the website www.BayfieldRiverFlats.ca but to control costs, no t-shirts, tote bags or badges will be mailed. This event is sponsored by the Bayfield River Valley Trail Association. The Bayfield Farmers’ Market is holding its last market of the season on Friday, Oct. 7. The market is held in Clan Gregor Square from 3-7 p.m. The Market enjoyed a very successful year, thanks to excellent weather and a growing base of regular customers who appreciate top quality local products. This year’s goals included increasing involvement of community groups and to find ways to “green” the market. Market coordinator Mary Brown is very pleased with the progress made on both fronts. Highlights of the season included the launch of the 2017 Bayfield Lions’ calendar, promotion of the Bayfield River Flats Project, the sale of eye-catching Bayfield Farmers’ Market bags, and the introduction of free tap water for market customers. The weekly draw continued to be very popular, with winners taking home a bountiful selection of products donated by the vendors. Sincere thanks are extended to local residents and visitors alike who have embraced the market and made it a success. In early spring of 2016 a notice was posted in the Bayfield Breeze asking if anyone was interested in forming an artist association in Bayfield. Many people came forward (and continue to), and thus the Bayfield Artist Guild (BAG) began. The diverse group of visual artists met during the summer months every two weeks to paint “en plein air” in Clan Gregor Square and Pioneer Park...attracting interested viewers and new members every session! BAG is interested in growing its membership and planning events for the members and the community for 2017. Membership benefits include discounts for supplies, resource list, peer support and lessons, encouragement and camaraderie and new friends. Our members are full and part-time residents from Bayfield and surrounding area all the way to London, Goderich, Ripley, as well as across Huron County. BAG is holding an important planning meeting on Oct. 14 from 9 a.m. to noon at the home of group member, Heide Bateman. Please email Bayfieldartistguild@gmail.com for location information. This meeting will see the members elect a “council” and plan fundraising events, members painting sessions, how-to sessions, and a “grand finale” event for August 2017. Please consider joining BAG and come out to the meeting. 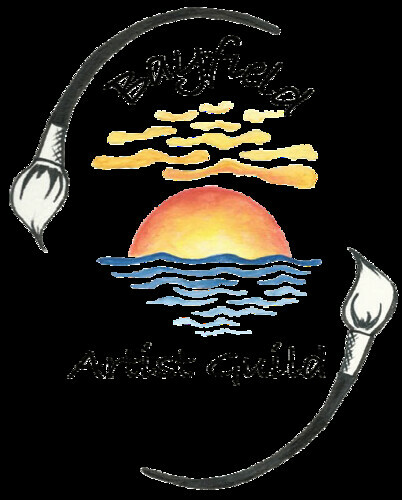 Visit Bayfieldartistguild.com for membership application, member gallery and more! On Sept. 28 it was announced that Huron Tourism Association (HTA) has voted to dissolve after 23 years of service. Given the HTA’s decision to dissolve, the County of Huron would like to thank their members for their past efforts. The HTA has performed an important function over the years and its contributions to the tourism sector are appreciated. Over the last two years, the County of Huron and area municipalities have developed a robust and coordinated approach to economic development. The Huron County Economic Development Strategy focuses on seven key industry sectors. Within this strategy, tourism has been enhanced to include arts and culture. Much has changed in the way that communities and businesses promote themselves in recent years and it is anticipated that these changes will only accelerate. The Huron County Department of Economic Development, working with the Huron County Economic Development Board and industry stakeholders, are now looking at an integrated Tourism, Arts and Cultural approach. The intent is to focus on the unique benefits and attributes of the county and to have engaged participants from the private sector assisting with the development and implementation of key priorities. Huron County offered to work through a transition with HTA that would have seen greater coordination in areas that are consistent with a dramatically changing tourism environment focused on key county and community advantages, increased use of digital analytics and marketing, and specific linking of innovative approaches to measurable outcomes. Huron County respects HTA’s decision and remains committed to working with the industry, communities and partners towards their strategic objectives. The Bayfield Town Hall Heritage Society invites community members to a special concert with an incredible story teller/songwriter on Oct. 20. Valdy, who has been part of the fabric of Canadian pop and folk music for almost 40 years, will grace the Town Hall stage. A man with a thousand friends, from Newfoundland to Vancouver Island to Texas to New Zealand, he’s a singer, guitarist and songwriter who can recognize the small but telling moments that make up life in his music. Valdy has sold almost half a million copies of his 13 albums, has two Juno Awards, Folk Singer of the Year and Folk Entertainer of the Year, a total of seven Juno nominations and four Gold albums to his credit. The concert will begin at the Town Hall at 7:30 p.m.
Tickets are $30 in advance, and $35 at the door (if any are still available). Tickets can be purchased through www.ticketscene.com, from Ernie King Music in Goderich, or by calling Sandy Scotchmer at 519 565-2830. St. George’s Anglican Church in Goderich is an historic and impressive building. It will be apart of the guest speakers’ topic at the next Bayfield Historical Society (BHS) meeting to be held at Bayfield Lions’ Community Building on Oct. 24. The parish and its records date back to 1835, and its first minister, Rev. Robert Francis Campbell later served at Trinity Anglican Church in Bayfield from 1849-60. The present St. George’s building is celebrating the 135th anniversary of its dedication. To celebrate this occasion, Eleanor Smith a former long-time Bayfield-area resident and Trinity Anglican parishioner has published a book commemorating the 43 people honored in its 26 stained glass windows. The oldest window pre-dates the existing church building and the newest was installed in 1964. She will be presenting a power point program to the BHS, starting at 7:30 p.m., in which she will tell the stories about some of the people to whom the windows were dedicated. The stories are of tragedy and heroism, of victory and defeat. The Bayfield River Valley Trail Association (BRVTA) will be holding their second annual Fall Harvest Dinner and Dance on Oct. 15th at Renegades Diner, Bayfield. Tickets are $35 and the evening starts with a Reception and Silent Auction at 6 p.m. with dinner at 7 p.m. After dinner, attendees can dance to live music by “Cheap Shirts”. “We hope you can come out for a wonderful evening and support Bayfield Trails!” said Roger Lewington, representing BRVTA. Folks are encouraged to get their tickets now. Tickets can be purchased by emailing info@bayfieldtrails.com or by calling Roger at 519 565-2202 or Scott at 519 565-2827. Tables of eight or more can be reserved. 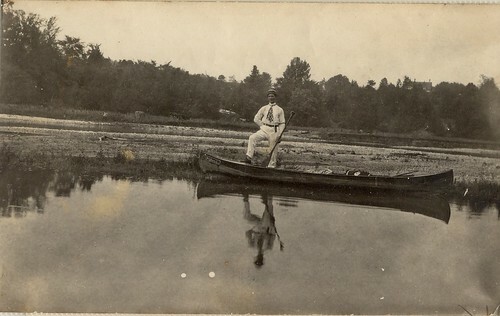 According to records, the gentleman in the picture is Lewis Thompson. The fourth annual Bayfield Fall Foto Fest (FFF), a joint production of the Photography Club of Bayfield and Photo Tour Trekkers, was held on the weekend of Oct. 1-2 Registrations this year were up by almost 50 per cent over 2015. 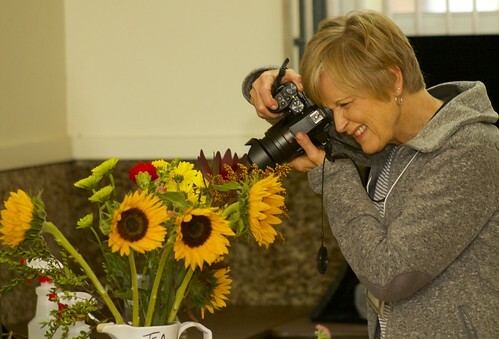 Participants in the eight workshops held at a number of locations throughout the village and beyond were able to gain hands-on learning in numerous aspects of photography in small-group settings: a hallmark feature of FFF. As well, the organizing committee added a bonus free Saturday evening workshop: Night Photography. The overwhelming interest in this workshop made it necessary to break it up into six sections to keep groups to a maximum of 15 participants each so as not to compromise the individual learning experience. 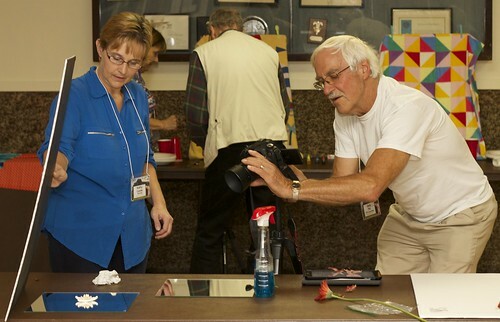 Rounding out the workshops were: Macrophotography, Studio and Portrait Lighting, Adobe Elements, Adobe Photoshop, Digital Video editing, Photography 101 and a very popular Windmill Lake workshop. Over thirty of the participants have come all four years which is a great testament to the quality of the event. Also new this year was the participation of twenty students from H.B. Beal Secondary School in London. 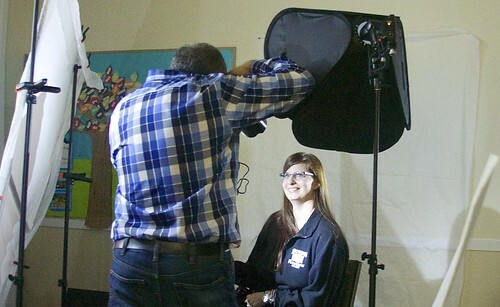 Their participation has sparked interest within additional schools throughout the region. 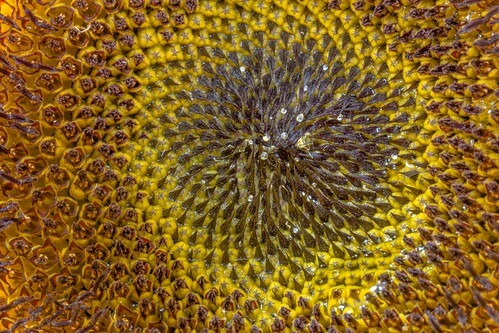 This macro image captured the heart of a sunflower. The winner of the People’s Choice Award was Zhugang Zheng with his entry titled, “Eye Window of the Soul”. Fall Foto Fest 2016 (FFF) held another successful photo exhibition and contest this year with over 160 submissions from all across Ontario and the Great Lakes States. Included was a smaller exhibition from the H.B. Beal Secondary School students who attended FFF. The three categories were: Landscapes, Wildlife and People. 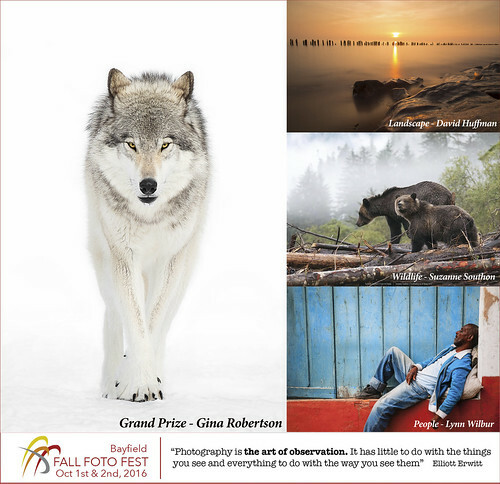 All submissions were on display to the general public and all registrants free of charge at the Bayfield Town Hall during the entire Fall Foto Fest weekend. Visitors were also given an opportunity to assist in the judging by voting for the Ashwood People’s Choice Award: a weekend for two at The Ashwood Inn. 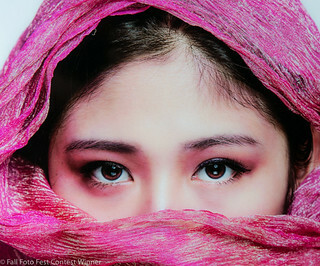 The winner was Zhugang Zheng with his entry titled, “Eye Window of the Soul”. All winners were announced at the closing Wine and Cheese reception on Sunday, Oct. 2. According to many of the FFF participants, the overall quality of the photos was outstanding. 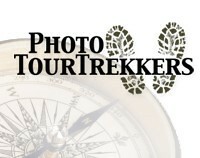 The Grand Prize donated by the event sponsor Photo Tour Trekkers, is a trip to Amsterdam in 2017 with Photo Tour Trekkers. The winner was Gina Robertson, of Lambton College, with her haunting photo of a white wolf in winter titled, “The last Alpha Male”. Organizers would like to pass on their congratulations to the winners and send out a special thanks to everyone that participated in the contest and to the prize sponsors. Photographers are encouraged to submit photos to next year’s event. There is no requirement to register for FFF in order to participate. The opportunity to take some action shots were a bonus for those photographers who went on the Field Trip Workshop to Windmill Lake & Eco Park. 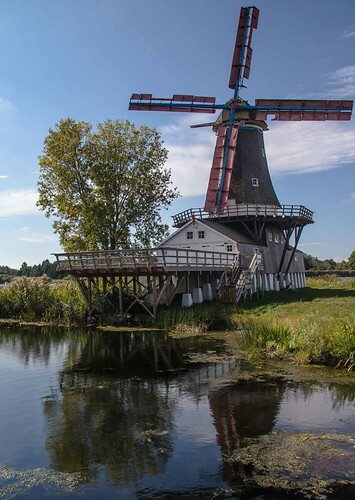 Fall Foto Fest participants had the option of going on a Field Trip Workshop to Windmill Lake & Eco Park to capture images of a local iconic structure. Although it threatened rain the weather proved perfect for the Field Trip Workshop to Windmill Lake & Eco Park. October is here and that means it is advertiser renewal time. Our Advertising Representative Mike Dixon is out pounding the pavement checking in with returning advertisers and hoping to enlist a few new ones too. It takes more than the time and enthusiasm of our merry little band to put out an issue every week. It takes money – albeit we do our best to be frugal. There are costs to send out our weekly emails, costs for domaine services and costs to host the wonderful myriad of pictures that make our publication rather unique, I think. P.S. I am happy to report that we recently hit 400 Likes on Facebook. If you haven't liked us yet head over to https://www.facebook.com/Bayfield-Breeze-206183479424800/.